The sailing venue for the 2020 Tokyo Olympics will be Enoshima, Kanagawa Prefecture, in Sagami Bay, approximately 40 kilometres (25 mi) southwest of the capital, Tokyo. Enoshima was also the Olympic harbor for the 1964 Summer Olympics. Enoshima is a small offshore island, about 4 km in circumference, at the mouth of the Katase River, which flows into the Sagami Bay. Administratively, Enoshima is part of the mainland city of Fujisawa, and is linked to the Katase section of that city by a 600-metre-long (2,000 ft) bridge. Here are some of the closest sandy beaches to Tokyo and Yokohama. The island in its entirety is dedicated to Benzaiten, Japanese Buddhist goddess of everything that flows: water, time, words, speech, eloquence, music and by extension, knowledge. The original characters used to write her name read "Biancaitian" in Chinese and "Bensaiten" in Japanese and reflect her role as the goddess of eloquence. Benzaiten originated from the Hindu goddess Saraswati. Worship of her began in Japan during the 6th through 8th centuries, mainly via the Chinese translations of the Sutra of Golden Light, a Buddhist text of the Mahayana branch of Buddhism (in Sanskrit, the full title is The Sovereign King of Sutras, the Sublime Golden Light). Because the Sutra of Golden Light promised protection of the state, in Japan she became a protector-deity, at first of the state and then of people. Lastly, she became one of the Seven Gods of Fortune when the Sino-Japanese characters used to write her name changed to Benzaiten, emphasizing her role in bestowing monetary fortune. The island is home to the scenes recorded in the Enoshima Engi, a history of the shrines on Enoshima written by the Japanese Buddhist monk Kōkei in 1047 AD. 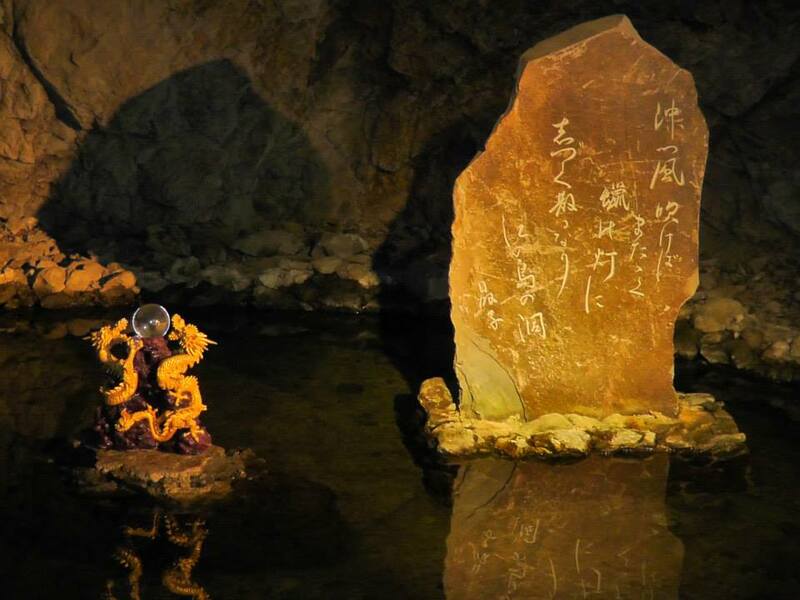 According to Kōkei, Benzaiten is the third daughter of the dragon-king of Munetsuchi ( literally "lake without heat"), known in Sanskrit as Anavatapta, the lake lying at the center of the world according to an ancient Buddhist cosmological view. Earlier documents such as those recorded by Buddhist monks link the periodic appearance of comets with the goddess Benzaiten. For example, the comet that appeared in 552 AD, and again in late 593 AD were associated with deity Benzaiten. The Enoshima Engi consists of two parts. The first tells the story of the tribulations of prehistoric villagers who lived in the vicinity of Enoshima. The villagers were plagued for a period of a thousand-some years by a destructive, five-headed dragon (Gozuryu) that had its lair in a nearby lake. Aware of their suffering, on May 31, 552 AD, the Goddess Benzaiten caused the island of Enoshima to arise from the bottom of the bay to serve as her abode. She then descended onto the island amidst a series of spectacular terrestrial and aerial phenomena. The dragon fell in love with the beautiful goddess and asked her to be his consort. Benzaiten, who was widely known for her persuasive eloquence, rejected the dragon's proposal and made it understand that it had been doing wrong by plaguing the villagers. Ashamed, the dragon promised to cease its wrongdoing. It then faced south (devotedly facing the island where Benzaiten lived) and changed into a hill. To this day, the hill is known as Dragon's-Mouth Hill (Japanese: tatsu-no-kuchi yama). In the Rig-Veda (6.61.7) Sarasvati is credited with killing the three-headed Vritra also known as Ahi ("snake"). Vritra is also strongly associated with rivers, as is Sarasvati. This is probably one of the sources of Sarasvati/Benzaiten's close association with snakes and dragons in Japan. The Sarasvati River (Sanskrit: sárasvatī nadī) is one of the main Rigvedic rivers mentioned in the Rig Veda and later Vedic and post-Vedic texts. It plays an important role in Hinduism, since Vedic Sanskrit and the first part of the Rig Veda are regarded to have originated when the Vedic people lived on its banks, 2nd millennium BCE . The goddess Sarasvati was originally a personification of this river, but later developed an independent identity. Of note, for all creators of musical or other kinds of eloquence, is that the word Poïesis (Ancient Greek: ποίησις) is etymologically derived from the ancient term ποιέω, which means "to make" and sprung from a word that describes the sound of water - or 'the song water makes' , it's 'voice'!. This word, the root of our modern "poetry", was first a verb, an action that transforms and continues the world. The second part of the Enoshima Engi relates visits to Enoshima by eminent monks. Among visitors were Jikaku Daishi, the posthumous name of Ennin (792-862 AD), the third chief priest of Enryaku-ji, the center of Buddhism in Japan. "Enoshima in the Sagami Province" by Hokusai (part of the series Thirty-six Views of Mount Fuji) circa 1830 - The classic view of Mt. Fuji as depicted in Japanese art can be seen from Enoshima on clear days (best season for viewing is during Autumn and Winter). 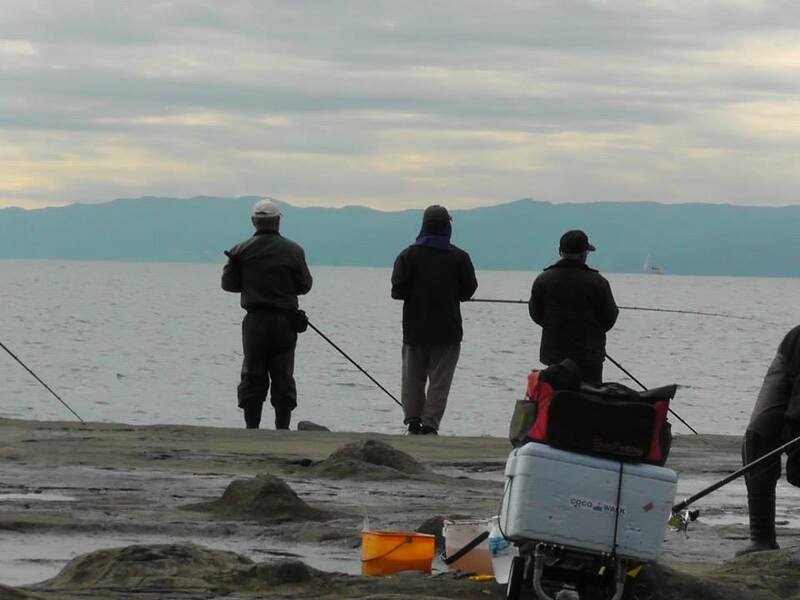 This picture shows Enoshima, at low tide, can be a peninsula. In 1880, after the Shinto and Buddhism separation order of the new Meiji government had made the land available, much of the uplands was purchased by Samuel Cocking, a British merchant, in his Japanese wife's name. Mr. Cocking first saw and fell in love with the island in 1869 when a typhoon blew the steamer owned by the then 28 year old into Sagami Bay. He developed a power plant and extensive botanical gardens including a very large greenhouse. Although the original greenhouse was destroyed in the 1923 Great Kanto earthquake, the botanical garden (now the Samuel Cocking Garden) remains an attraction with over half a million visitors a year. This side of the island is where you will find the resident fishermen. Tidal pools here brim with crabs and trapped fish (we saw heaps of giant koi), making the western face of Enoshima a favourite fishing spot. These Falcons, or giant hawks called tombe, are everywhere in Japan were really numerous around the fishermen ..15 to 20 wheeling around them all the time. The Iwaya* caves are split into two parts, the first contains religious objects, historical photographs and preserves most of the original interior from hundreds of years ago. The entrance fee includes candle lanterns carried to light up danker portions of the cave. You turn to the left to go into the first cave (152m long). There are some framed photos and explanation panels here. After you walk two thirds into it, the cave divides into two. The innermost left spot is said to be connected directly with the “hole to hell” at Narusawa ice cave near Mt. Fuji. A bridge over the shore connects the first cave to a further second one dedicated to Enoshima’s dragon, Gozuryu. This cave has had cave ins during the past and was closed at one point in 1971 for 20 years. Enonshima's main pathways lead to all the places of interest and go over the top of the island to the west side. Be warned that it can be a steep hard walk for some. * Iwaya means 'huge rock', large rock etc. A drop spread, the cave of Enoshima. This poem, composed in July 1911, was included in the poem book, Seigaiha (published January 1912). 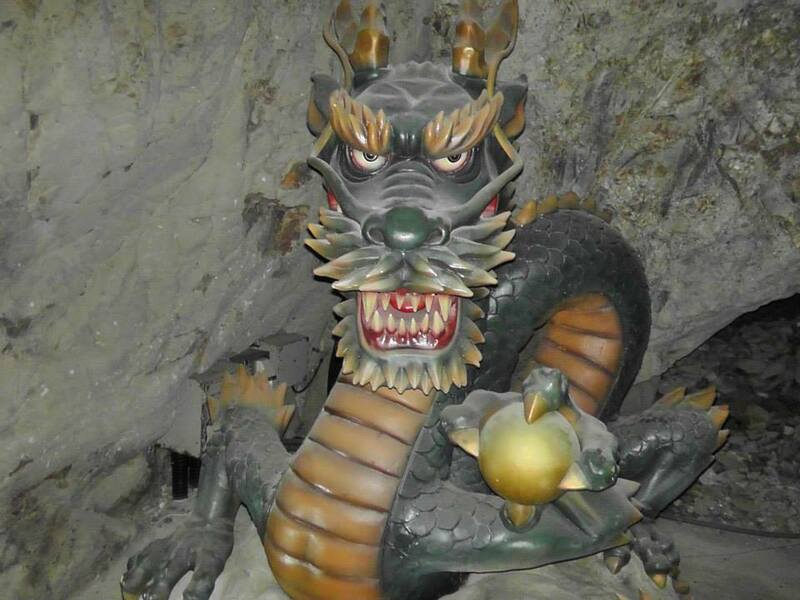 Over ninety years later, the candles are still burning and lighting the way for visitors within the cave. The poem wads calligraphed by Saeko Ozaki who was the leading auhoity of the study of Akiko. The monument was established and donated to the City of Fujisawa by Seihin Nakayama who resides in Fujisawa. Photos taken by Paul Wheeler November 2015. editorial/text curated by AJG - Page by Paul Wheeler, 2016.